ISO 20000 is the international standard for IT Service Management (ITSM), published by ISO (the International Organization for Standardization), and ICE (the International Electoral Commission). The standard describes a set of management processes designed to help you deliver more effective IT services (both to those within your business and to your customers). ISO 20000 gives you the methodology and the framework to help you manage your ITSM, while allowing you to prove your company follows best practice. With the requirements of the standard you will achieve best practice, helping to improve your delivery of IT services. And ISO 20000 is applicable to any company size and any industry. What is path to Certification? A proven Service Management System (SMS) development and implementation approach is based on project management methodologies. We use a structured approach for defining project plans, specific responsibilities and verification of results. The result is a development and implementation strategy that is more efficient and provides for first time compliance or registration to the ISO 20000 requirements. Documentation Development and Tools Implementation. The objective is to instantiate the process, plan, and tool infrastructure for the SMS. The key document for the SMS is the Service Framework. The document lays out the scope of the SMS and maps the process infrastructure and associated relationships. Concurrent to the Framework, we develop and tailor the required Service Management Plan, Service Catalog, Service Level Agreements, policies, processes, procedures, work instructions, plans, forms, and templates. To support the process implementation, we utilize your existing IT infrastructure to implement simple and easy to use tools. For most organizations, we configure an existing Microsoft SharePoint portal environment or ServiceNow platform to implement a process asset library, change-tracking tool, incident and problem management tool, corrective action tool, process improvement request tool, and risk management tool. Training and System Implementation. The objective of this phase is to train your functional staff on the activities and artifacts/records needed to support the SMS and substantiate the system for audit. We offer Microsoft PowerPoint or SCORM-compliant Computer Based Training (CBT) process training options. After completing the training, we work with you to implement the processes and plans. As execution proceeds, we collect and monitor process and performance data to incrementally improve the SMS. Internal Assessment and Management Review. The objective of this phase is to objectively evaluate the SMS and engage management to improve the system. We purports the use of process based internal audits versus a simple auditing against the standard. While both will achieve compliance to ISO 20000 requirements, the process-based approach will provide more useful information on how well the processes are working and improving your organization. We offer multiple options to complete an internal audit. For many organizations, we lead the initial internal audit with a customer team. This provides an opportunity to learn hands-on from an industry expert. For others, we simply provide training and the audit is done internally by the customer. We support you to plan and hold a successful management review meeting. As part of that meeting, executive management reviews the implementation of the SMS focusing on internal audit results, resources, customer feedback, and the analysis of measurement data. The results of the meeting are to communicate the status of the SMS and engage executive management in the improvement of the system. 3rd Party Certification Audit. 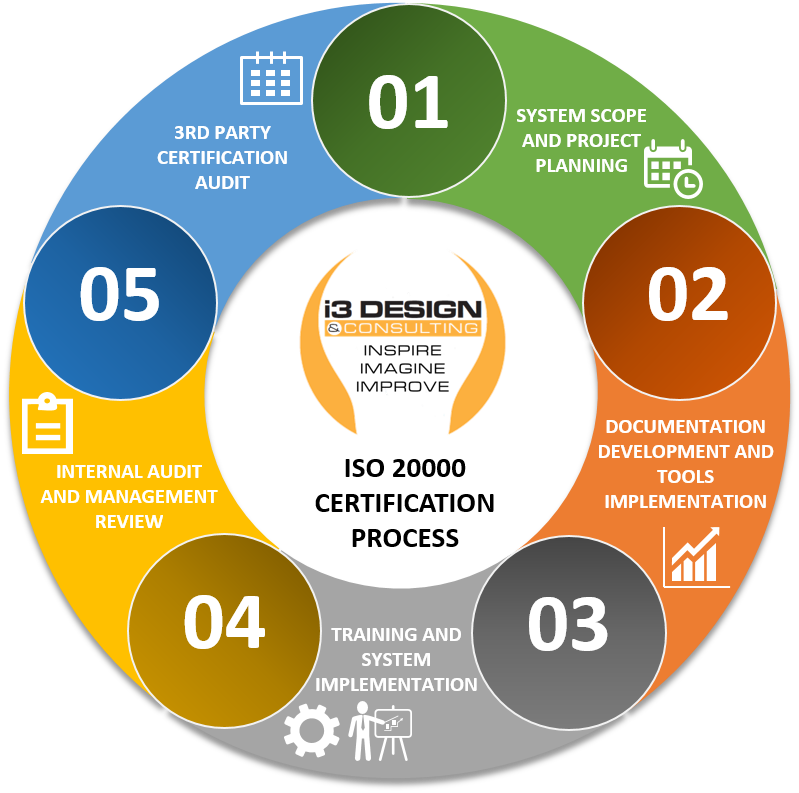 The objective of this phase is to prepare you for the 3rd party certification audit. We provide recommendations on qualified registrars, prepare the registrar assessment plan with the registrar, and coordinate the scheduling of the audits. We prepare your external audit representatives and most likely interviewees to increase the comfort level with typical audit questions. ISO 20000 is a more complicated standard to implement. Putting the system in place can often take as little a 4-6 weeks (depending on size and complexity), but you will need some objective evidence that the system is operating as intended. For simple systems, this can be as little as 4-6 months. Other more complex systems will require more time to instantiate and prove use. Scheduling Auditors. Qualified auditors can be a scarcity depending on the standard. There are firms that will promise an ISO 20000 (or other) certification but are not qualified registrars. For certification to be considered legitimate (especially for government proposals), you need to make sure the entity is approved by ANSI-ASQ National Accreditation Board (ANAB). ISO 20000 external auditors are difficult to find and schedule. Scheduling is done through the qualified registrars. ISO uses a two-stage audit process with an on-site readiness review followed by the certification audit. There generally needs to be at least 30 days between these events. At a minimum, you should have your auditor under contract 90-120 days from the certification audit date. Registrar Quality Review. Once the audit is complete, the results must be validated by the ISO registrar before the organization officially can claim its qualification. You should plan for 2-3 weeks for these reviews although they often are completed faster. You don't need a consultant to achieve ISO 20000. However, if you are attempting this standard without outside assistance, it is highly recommended that you are an expert in IT Service Management and ITIL. Using an experienced consultant can significantly improve the implementation speed and the effectiveness of the system. Our goal is to help your organization improve its business AND ensure you receive your certification. Our approach focuses on improving your current business processes and functions while using the standards as checkpoints to validate your success. For each project we identify measurable goals and return on investment expectations. The intent is to make sure that any process changes brought forth by the introduction of the standards into your environment improve the business performance. The implementation team has limited experience designing and implementing a new system. To be clear, having worked under an ISO 20000 system is not the same experience as designing and implementing a new system. Moving forward with limited ITIL experience is not recommended without outside assistance. Your company plans to implement more than one standard (now or in the future). If you plan to pursue other ISO standards beyond ISO 20000 certification (such as ISO 27000) or implement CMMI for Services, then you should consider implementing an integrated management system. This is a complex system design and the use of a consultant is highly recommended. Making appropriate design decisions on your initial ISO 20000 system design can greatly reduce the cost and rework as you add new models and standards to your management system. Non-standard implementation. While the standard can be used for any type of work and has been improved through the years, the standard can be confusing to implement in services-based organizations or when used for back office functions. Using a consultant with experience in these types of implementations will lower costs and greatly improve the efficiency and effectiveness of the system. Best option for companies that want a complete solution and only need limited expert consulting. Assumes a 20-week implementation. Pay-As-You-Go Package includes 2 hour of setup, 16 hours of consulting support, 4 hours for coaching, and 8 hours of support for documentation review. Additional hours can be purchased and scheduled as needed directly through the i3 web site. Best option for companies that want active project management, document development and tailoring, and meeting coordination, but want the lower cost of a generally remote consultant. Assumes a 20-week implementation.